Granted, the errors we debugged in the last section were pretty straightforward—no different from debugging in any other environment. But most applications are not as simple as DebugTest, and many problems are much harder to isolate and solve. Android provides a general-purpose logging facility that can help with many of those more difficult problems. As mentioned before, there’s a logcat pane on the Debug perspective (it’s also in the DDMS perspective). 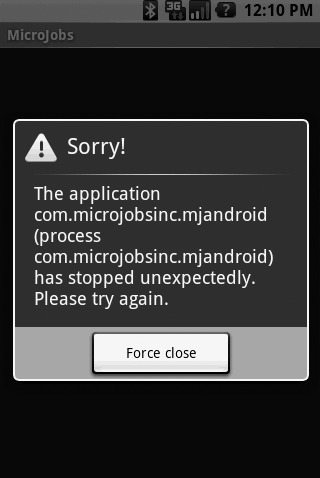 The log for DebugTest isn’t very interesting, so instead start MJAndroid in Debug mode and we’ll take a look at its log. After the application comes up in the emulator, Eclipse switches to the Debug Perspective and shows the logcat pane on the lower right, as it looks in Figure 10. To make the pane large enough to be useful for reading the log, click on the “full screen” symbol at the upper right of the pane, and it will expand to fill the Eclipse window. You will then see that there are hundreds of log messages in the file, going back to when Eclipse first started the instantiation of the emulator that you are using, continuing through the boot process for Android, loading all the applications, and finally loading and executing MJAndroid. How are you supposed to find anything useful in all of that? which actually appears all on one line; we’ve broken it here so it will fit on a printed page. This is a log message from the Activity Manager telling us that it started MicroJobs with process ID 163 (it will probably be different as you run it). If you click on the green cross at the top of the logcat pane, it will let you define a custom filter. Fill in a random name and the pid number that you saw in the log. Now the log is filtered to show only the messages that apply to this instance of MicroJobs. There are likely still a lot of messages, which you can filter further (using the D, I, W, and E buttons) or just scan. If you ask other people for help debugging an error in your own program, one of the first things you’ll likely be asked for is a copy of the logcat output. You can easily extract the content of the logfile to a text file by selecting what you’d like to preserve and clicking on the little down arrow at the upper right of the logcat pane, which brings down a pull-down menu. One of the selections on the menu is “Export Selection as Text...”, which takes you to a dialog where you can name an output file for the log text. Logcat gives you a lot of information about what happened as Android tried to run your program. It is very useful when you get a generic error message from Android that doesn’t tell you much. Let’s demonstrate one of my (least) favorites. In Eclipse, go to main.xml for MJAndroid and remove the apiKey line under the MapView declaration (save it in a text file or somewhere, so you can restore it; we’re doing this just to generate an error). The apiKey is needed to access mapping information, so removing it brings the program to a screeching halt. When you run the program, the emulator screen looks like Figure 11. The first three errors basically tell us that Android could not start our application because it could not inflate the Views it found in our layout file. The last error block we showed in the output clearly tells us we need an API Key for each MapView. Logcat is often the best way to get insight into errors where there isn’t specific information otherwise. - Windows Phone 8 : XAML Overview - What Is XAML?